A few weeks ago my good friend Joi Ito added me an e-mail chain with a few guys in Portland at Uncorked Studios who had an idea for a website tracking and mapping radiation readings in Japan. It launched almost immediately and I mentioned it on BoingBoing because the guys seemed cool and I really liked every aspect of what they were doing. We started talking more, gradually pulling in another person here and there as the conversation ventured into territory unbeknownst to us but knownst to others. Before long emails stopped saying “you guys” and started saying “we” – completely unintentionally we’d formed a team and the project was fast becoming something much more than a simple mapping site. David Ewald and Marcelino J. Alvarez from Uncorked have been our main points of contact, though I’m sure there are others there who have been helping out just as much. In addition to Joi and myself, we’ve managed to rope in Akiba, Pieter Franken, bunnie Huang, Aaron Huslage, Ray Ozzie and Dan Sythe, as well as a few others to the “team.” And yes, that is indeed on hell of a team. Two of the most exciting aspects of the team for me is how organically everyone came together, and how, while obviously some people are better and more focused on some aspect over another, by and large there is no compartmentalization – we’re all talking about everything together and constantly brainstorming. But as interesting as that might be, it’s really nothing next to the project itself. So the problem is this: The vast majority of the radiation data that is out there comes from the pro or anti nuclear camps. By design, figures coming from groups that have a stake in those numbers being high or low aren’t very trustworthy. And even if they were trustworthy, they are all reported differently, sporadically and without good geolocations. For instance, giving radiation figures for Tokyo is fairly useless since radiation can increase or decrease dramatically essentially across the street. Or an hour later. And while there are more and more sensors in the hands of consumers, there isn’t a a central point where all that data is. Enter RDTN.org. That is the site as it exists right this moment. The majority of the data on the site is from existing sources – MEXT, US EPA, Greenpeace, etc but there is also a mechanism for people to submit readings they’ve taken on their own. This is actually the most important part and the thing we’re focusing on the most. As you can see the data that is coming in right now is clumped in certain areas, however if we can get enough sensors out to people then we can fill in those gaps and present a much better picture of what is really happening right now. And if we can package up all that data into a format that makes sense and then make it available for anyone for any purpose, that could become a very powerful tool for people. There’s a few phases to that clearly. We’ve got the website up right now. 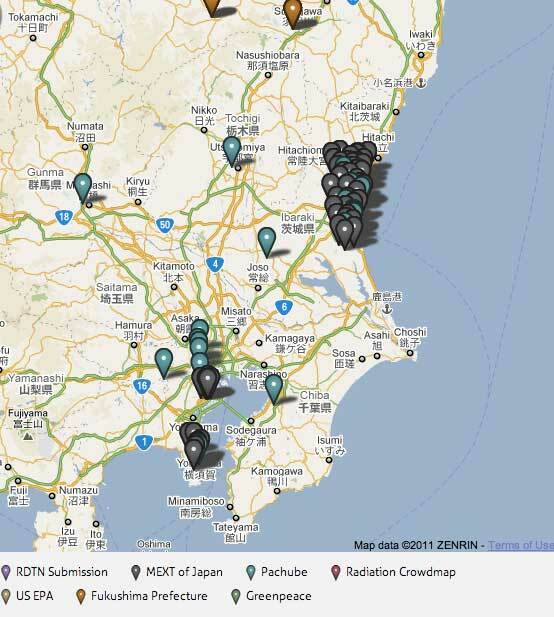 We’ve just launched a Kickstarter to help us raise the funds to buy about 600 geiger counters that we’ll be distributing around Japan over the next few months – though this will require people to report the readings back to us. Which is why we’re also in the process of designing our own device that will take readings and transmit those findings back to up automatically and much more frequently. This will be some pretty impressive data to look at, and assuming all goes well with Japan, well, that’s just the first step. I’m really excited about this project because it really hits many of my interests square on. It takes power (data) out of the hands of a small set of privileged gate keepers and gives it to the people who actually need it. It does this free of charge which very directly has the potential to make the world a better place. I know that sounds lofty, but that’s kind of the point. You can’t really propose going over the heads of the collective atomic industry and think of it as a minor objective. In order for this to matter it has to be massive, and so that is the plan. Later this week I’m heading to Tokyo for The New Context Conference which has shifted in focus since the recent earthquake to disasters, emergency and social media playing a big role after the fact. Many of the other RDTN team is traveling there as well and we’ll have one of the first planning sessions with several of us being in the same room (and timezone) rather than different countries connected by Skype. I expect much more awesome to come from this soon, so stay tuned.